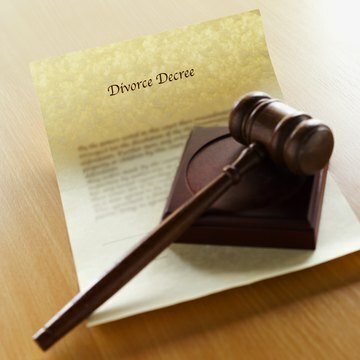 If your spouse has filed a Petition for Divorce, you have the right to contest any stated grounds, as well as the terms of the divorce such as child custody, the division of property, and the amount of alimony or support payments. A contested divorce can be time-consuming and expensive for all parties; if the parties are unable to work out a compromise, a judge will set the final decision on the terms of the divorce after a required hearing takes place. You should always consult an attorney in contested divorces. File an Answer or Response to the Petition for Divorce, which should have been served on you or your representative by an authorized process server. You will have a statutory deadline for filing; a common period of time in many civil courts is 20 days. The Answer should state your grounds for contesting the divorce petition. If you are unable to file the Answer within the deadline, request an extension of time from the court with good cause for the late filing. Prepare for a hearing, at which you will state your case for contesting the divorce. You may contest any grounds for divorce asserted by your spouse with documents, other evidence and/or witness testimony. Your spouse has the right to rebut this evidence; the court will decide if the asserted grounds for divorce are valid. All states provide for "no-fault" divorce, in which "irreconcilable differences" or some other generalized condition is given as the reason for the divorce. You cannot have such grounds overturned in court; if this is the case, you can only contest the proposed terms. Explain to the presiding judge any challenge you are making to the terms of the divorce set forth in a proposed marital settlement agreement. In the matter of child custody, for example, you may need to prove that you are more fit to serve as the child's custodial parent. For child support or alimony payments, you may have to present evidence that you are unable to provide the monthly amounts requested. You may also contest a proposed division of property, such as title to a home or property held in common with your spouse. Listen to the judge's decision on contested grounds or divorce terms. The judge must provide grounds or precedent for his decision, which must be guided by state law and its intent. You may appeal this decision, or in some states file your own proposed marital settlement agreement, which can then be negotiated between the parties. The court may also refer the case to mediation. Illinois Legal Aid: How Do I Contest the Grounds for Divorce? If you want to get a divorce but your spouse does not, you may be able to dissolve the marriage anyway. A contested divorce can be complicated and time-consuming. Unlike a divorce in which both parties agree to end the marriage, a contested divorce generally requires you to attend a trial in front of a judge and argue why your marriage should be dissolved. As you proceed with your divorce, remember that the divorce laws and procedures for divorcing an unwilling spouse vary from state to state. Any court proceeding, including a divorce, has a schedule that the judge has set. Many courts issue scheduling orders that set the time for discovery cut-off, motion filing cut-off, settlement conferences and mediation. In courts with mandatory divorce mediation, the mediation panel may decide the schedule. Work schedules, other prior scheduled obligations and emergencies may interfere with the dates mandated in the court's scheduling order. If appropriate, a judge may grant a postponement in a divorce case.